Let’s be real here, reviews are hard. Or at least for me they are. They feel even harder when I have to describe something like From Under The Mountain. It starts slow like all of this genre does, but then becomes a friend. The world and the characters bit by bit reveal themselves to you. And my main questions while reading become ‘what are they up to’ and ‘are they okay’? Another thing I’ll forever be grateful for is there is no shock for shock value here. I got to enjoy the diversity without having to tolerate bull to get there. There was some gory, and spooky things but they all felt like a true part of this world. While I length of the paperback lends itself akin to a weapon, I just might use it as such if I could have all the questions above answered now. Is Theo okay? Will he stay okay? How about my baby girl Guerline? Ahem, I mean four out of five stars to From Under The Mountain. 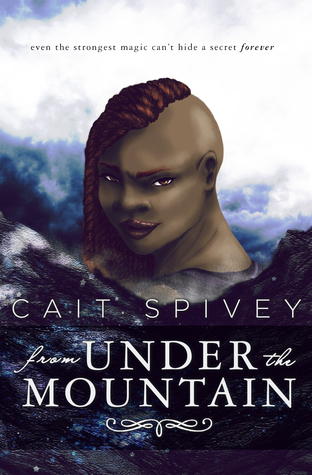 If you aren’t convinced yet check out this book’s amazing author: Cait Spivey is a speculative fiction writer, author of high fantasy From Under the Mountain and the horror novella series, “The Web“. Her enduring love of fantasy started young, thanks to authors like Tolkien, J.K. Rowling, Diane Duane, Tamora Pierce, and many more. Now, she explores the rules and ramifications of magic in her own works—and as a panromantic asexual, she’s committed to queering her favorite genres.